Utakata is the Jinchuriki of the Six Tails from Village Hidden by Mist. However, he defected from the village during the “Bloody Mist Era”. Utakata [Six-Tails Jinchuriki] was reincarnated using Edo Tensei during the Fourth Shinobi World War along with other Jinchurikis. Ninjutsu Toxic Foam Outburst [Prompt]: Causes Water Attribute damage up to 9 of the opponenet’s units (including a selected unit) who are suffering from Poisoning. The selected unit will also suffer from Knockdown. Taijutsu, Ninjutsu Bubble Attack: Attacks the opponent’s units in the front row and has fixed chance of 10 COMBO. Ninjutsu Water Style – Toxic Foam Jutsu: Triggered with at least 20 COMBO, attacks 4 of the opponent’s units with Water attribute damage and will cause the units to suffer from Poisoning. Taijutsu Foam Voyage: Chases and Attacks a Knocked Down unit, causes Repulse. Will also generate shield for this unit based on this unit’s Resistance base attribute. 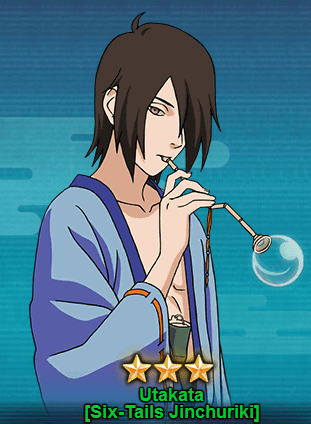 You can get Utakata [Six-Tails Jinchuriki] from the Jincurikki Treasure 2. It will take almost 60-70 seal scrolls draw to get Utakata. However, I’ve seen him available on certain events. Maybe you might get chance to get him using coupons on some of the weekly events.